It's Then Sings My Soul Saturday when I link up with Amy of Signs, Miracles and Wonders. You can visit Amy and find other participating blogs. For the past few days, I've been waking up with this song in my head. It's an old classic called "Have Thine Own Way Lord". I guess it's because of what's been going on in my life lately and where I am spiritually. I'm learning to lay it ALL down and to trust the Lord in ALL things. I love the beautiful landscape photos and the soothing music and lyrics in this video. 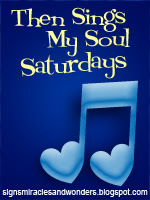 Happy Then Sings My Soul Saturday and thanks for visiting Heart Choices! Did you make it to the luncheon today? I was having an unexpected dental surgery so missed out on it. Your heart is so sweet. Hope your weekend is a beautiful thing. We used to sing this hymn at the end of meetings in my youth. It's a mighty interpretation of the first sentence in The Lord's Prayer,"Thy will be done." As I'm getting older and less cocksure, I find that the Lord's will is more reliable and wiser than my shortsighted one. When He has his way, it's bound to turn out for the best for us too. I thought of this little verse from the letter to the Philippians, chapter 4, a a special greeting for you. "19And my God will meet all your needs according to his glorious riches in Christ Jesus. " I always love the old classics! Sometimes I sing them without really taking the words seriously, but then when I hear them, I always feel at peace with my surrounding. Praying over you this day as you lay it down! Ahhhh rest in Him as He picks it all up! I love that song! Another one that comes to mind is: "I Surrender All". They both serve to remind me of the need to live moment-by-moment at times. Yes, that is a wonderful song, one that we would all do well to take to heart. Blessings to you, Debbie! Beautiful video...the lyrics of this hymn speaks the prayer of our hearts...love this! Dear friend, this is one I still sing unto the LORD. I love it so much because it speaks the depths of my heart toward GOD. I so adore you Debbie. Love ya. I've always loved this old hymn. Thanks for sharing. Debbie, the scenes as Jim sang the words were absolutely beautiful. That is the cry of my heart, and I know it is yours too, to be in the perfect will of God, following closely as He leads me. I think I'm going to have to buy this cd...we both chose Jim Reeves today, and after hearing both of them, I just want to hide in my bedroom and spend the day with the Lord. Hope things are better for you...continuing to pray and lift you up. That was just beautiful, Debbie, I loved it. Thank you so much for sharing it. I was so sorry that you were not able to make the luncheon on Friday. I so missed visiting with you and Mary. I believe we are going to have another get together in February, I so hope you will be able to make it then. We had a wonderful time. As always coming here, made my heart sing, and my mind a lot less weary. Thank you for sharing this beautiful Sunday, November day. Such a beautiful hymn! He is the potter and we are the clay. Thank you for sharing Debbie. Heading to bed! But wanted to stop by to say that I pray God's blessings, peace and joy to you, dear friend! Your blog caught my eye this morning as today is the 147th anniversary of the birth of Adelaide Pollard, the author of "Have Thine Own Way." Do you know the story behind the song? If not, I invite you to check it out on my daily blog about hymn history, Wordwise Hymns.